You are purchasing 24 total 10 oz. 12 oz. or 16 oz. clear plastic disposable cups. Added to the cups is a design printed out of vinyl from our shop and placed on the cups for your ease. Take pictures at your party of your guests drinking out of them. Kids birthday party, party, Baby Shower, or just for some good old conversation and laughs at a get together. Colors will vary due to monitor settings. 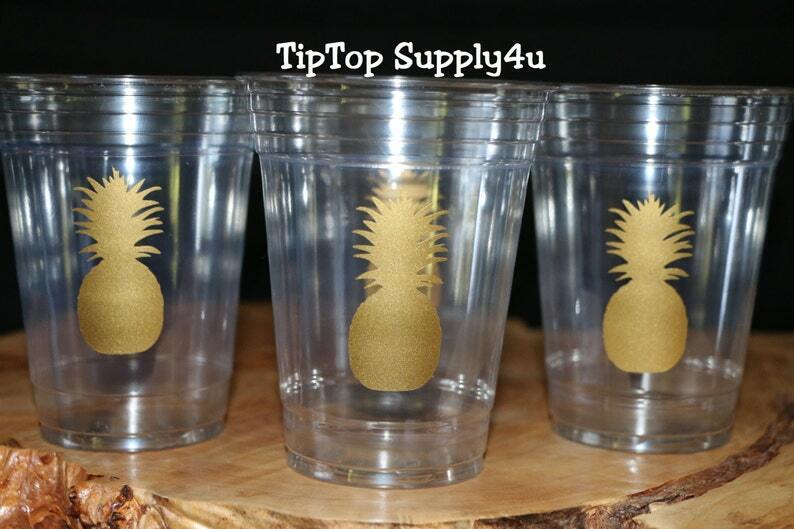 Cups are shipped via USPS Priority mail flat rate or in regional boxes depending on quantity ordered and size of cups. Check out all my other Stuff from gift tags,mustache thank you tags, vinyl stickers, drinking cups, napkins, and more. Super quick to ship. Cannot wait to use these at a wedding shower in April. Visa, master card, american express, discover, etsy gift cards, & PAYPAL. We do not except returns. All our items are custom as you select the colors wanted and they are made at time of order. If ordering vinyl to place on a wall lease be aware that some paints have a stain-blocker in them that makes it very difficult for the vinyl to adhere well. One example of this type of paint is Behr Premium, but there are others. Please check your paint before ordering to make sure it doesn't have a stain-blocker in it. High gloss paints will make it hard or impossible to stick so keep that in mind. Please check you address on your account prior to payment. We print off of etsy and send to the address on your account. You will have to pay shipping again if your item comes back. We are not responsible for lost or damaged items. Everything is shipped with a tracking number and currently all but vinyl stickers are sent priority with insurance included. If you want insurance on your vinyl stickers add priority shipping upgrade available at check out. USPS provides insurance not TipTop Supply4u. We ship with a tracking number & Etsy sends it to you once we purchase and print your shipping label. We use USPS. Occasionally, packages can be damaged during transit. To keep costs down, we don't normally include insurance. But, let us know if you want to insure your order as we cannot be responsible for any damage that occurs during shipment. We are not responsible for lost or damaged items. Everything is shipped with a tracking number and currently all but vinyl stickers are sent priority with insurance included. If you want insurance on your vinyl stickers add priority shipping upgrade available at check out. USPS provides insurance not TipTop Supply4u. You will have to follow the post office refund policy if there is damage or your item gets lost. This is not covered if the tracking number shows it delivered to the address on your account. International shipments may incur additional import taxes. We have no control over this, so please check with your local postal office before ordering so there are no surprises. We only message via Etsy messages. Email is not checked. A: Yes - our decals will adhere just fine to lightly textured walls and you will see the texture through our thin, high-quality vinyl. It will look as if the design has been painted on your wall. Q: The paint on my wall has a dirt blocker additive. Will decals adhere to this? A: Certain paints that have a teflon-type additive to resist dirt also resist wall decals. So check your paint before you decorate. Let's all march in protest of these evil paints! A: To remove the decals, start at a corner and simply peel them away. They will come off easily and will not damage your walls. Landlords love us! If a little tricky to get off turn on a blow dryer to help lift the edge. A: Yes, vinyl stays on with condensation and it takes some effort to get it off but will come off if peeled with some effort. No vinyl is permanent but I have had mine on cups for over a few years. Vinyl can not withstand the heat of the dishwasher or microwave so keep that in mind and hand wash if you are wanting them to stay on a reusable cup. Q: You offer custom colors but I do not see the options. A: I have a color chart on the last page in all my listings that offer custom colors. Select custom colors and when purchasing during checkout with a purchase message say the custom color name. Make sure it is exact name from the color chart to avoid order delay. Some listings only offer one color, if that is all that is what you message. If it has two colors message two colors etc. Please message via etsy messages as that is the only way we communicate with buyers or potential buyers. We do not use the email attached to our etsy account with buyers. All communication needs to be via etsy messages. Where is your color chart? My color chart is the last picture in all my listings. Do lids come with your cups listing? My listings for cups do not mention lids but under size when ordering if you select Lids + cups lids do come with your order. It is an added item at a higher cost. and not part of the original listing unless selected under size when ordering. If ordering cups I have sizes to choose from that you select during ordering so make sure to scroll the options. I do not offer font as my machine messes up small font too much. You can select custom colors when ordering and with a purchase message during check out make sure to message me the exact colors wanted for the vinyl decals or the vinyl decals on the cups. Make sure to message exact color names from my color chart that is the last pic in the listing to avoid any order delay. Always feel free to message me via etsy with questions. Email is ignored so just via etsy messages please. Are your cups disposable and BPA free? Yes, all my cups are quality durable disposable cups and BPA free.